The Mondo Marvel Panel hit hard and fast. Here's a rundown of the new books and character hooks that were revealed. 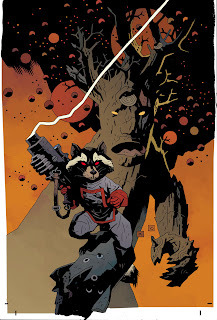 The Sweetest Pick: January's Rocket Raccoon and Groot will have a cover by Mike Mignola and be written by Dan Abnett and Andy Lanning. Four new Cap books are on the way, including Captain America: Man Out of Time, which reunites writer Mark Waid with the character. Iron Man/Thor by Abnett and Lanning launches this November. THE CRUNCH: Rom, Space Knight will appear in an Avengers story * The Ultimate line expands with October's Ultimate Thor by Jonathan Hickman and Carlos Pacheco, and December's Ultimate Doom by Bendis * Loki gets his own book this October * Araña will take over as Spider-Girl, Mayday Parker bows out with Spider-Girl: The End * Illuminati are back in trouble in Avengers #7. Nice picks IFF! 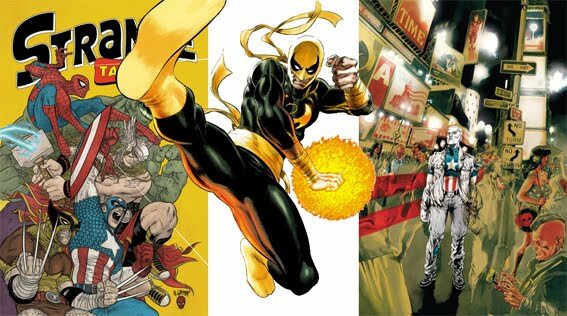 I like the Iron Fist is moving into more of a spotlight too, but I don't get why they aren't running with Danny and Luke Cage? That combo just seams to sweet to pass up... Still I guess we will see when Power Man debuts in a few weeks! I guess Marvel is sticking with their duo in New Avengers and also Van Lente stated Luke Cage will still play a role in both minis. Am not sure the chemistry Danny n Luke have can be replaced but since the New power man is danny's student Luke & Danny will be like a mentor guiding him to the right path that is how i see it.